This Sept. 22, 1993, file photo shows the wreckage of the Amtrak Sunset Limited train, north of Mobile, Ala. A barge hit a railroad bridge and minutes later the train hit the bent tracks and plunged into the bayou, killing 47 people and injuring more than 100 others. A string of crashes involving Amtrak trains is rekindling memories for survivors of the passenger service’s 1993 tragedy, its deadliest accident ever. In the dark of night, three travelers advanced inexorably toward tragedy. Accompanied by her parents on her first train trip, 11-year-old Andrea Chancey couldn't sleep despite the steady rocking of the Amtrak coach. Aboard the same train after missing a flight, Ken Ivory lounged nearby. Miles away, Willie C. Odom steered a towboat as it pushed barges up a river that was getting foggier by the mile. A bump. A whoosh. A ball of fire. 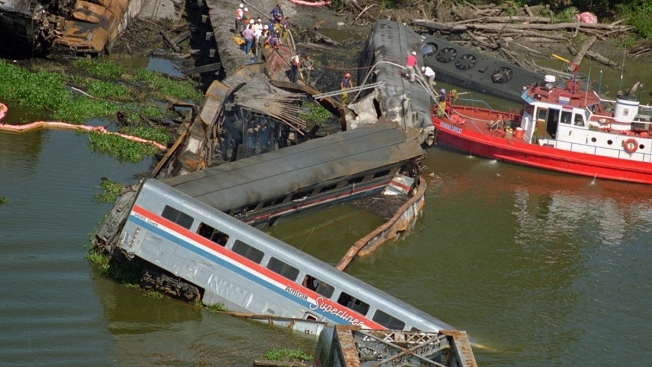 Suddenly, those three and more than 200 other people were caught up in what remains the deadliest accident in Amtrak history, the derailment of the Los Angeles-to-Miami Sunset Limited in a south Alabama bayou in 1993. Forty-seven people died and more than 100 others were hurt. Nearly 25 years later, the survivors remember that night vividly: "I smell the oil. I see the fire. I hear the screaming," said Chancey, now 36. But many others forgot about the disaster as other tragedies occurred, one after the other, through the years. Once survivors and victims were plucked out of a river delta so remote it's called "America's Amazon," the National Transportation Safety Board opened an investigation. The agency held a public hearing in Mobile, just miles from the bayou, made multiple recommendations to improve safety, and the world moved on. The same will no doubt happen in the aftermath of a recent string of three Amtrak accidents that killed a total of six people and injured about 170 others in Washington, Virginia and South Carolina. But for those who witnessed the horror of people drowning in rail cars at Big Bayou Canot, everything comes rushing back with every Amtrak disaster. It's particularly true for Chancey, whose parents both died in the crash. Chancey sometimes wonders why she lived when so many others died. Did one of her parents lift her out of the bayou waters before drowning, as news reports at the time said, or did God save her for something special? Or was it simply luck? Ivory, a Texas oil industry worker who helped save Chancey all those years ago, has a theory. "She was the chosen one," said Ivory of Houston. Retired Marine Lt. Col. Geary L. Chancey, a pilot and Vietnam veteran, and wife Mary Jane Chancey, a schoolteacher, adopted Andrea when she was only a few weeks old. Born with severe cerebral palsy, their girl would need assistance the rest of her life; she still uses a wheelchair and has home health-care aides who cook and clean for her. The family was living in Orange Park, Florida, in 1993 when they boarded Amtrak's Sunset Limited for a trip to visit relatives in Ocean Springs, Mississippi. Andrea's wheelchair made boarding more difficult than for other passengers, but she was thrilled about her first train ride. "I thought it was the coolest thing," said Chancey, speaking with The Associated Press in her first interview since the accident. Their visit to the Gulf Coast done, the Chanceys board the eastbound Sunset Limited toward home at Biloxi, Mississippi, the night of Sept. 21, 1993. The train was running about 30 minutes late because of an air conditioning problem that was repaired in New Orleans. Around the same time, Willie Odom was piloting the towboat Mauvilla as it pushed six barges away from a wharf in Mobile and up the winding Mobile River. The journey would take the boat northward into the Mobile-Tensaw Delta. With the landscape shrouded in fog, a confused Odom unknowingly turned off the river into Big Bayou Canot, a narrow, non-navigable waterway that snakes through the delta and is crossed by a railroad bridge that lacked lights. As Odom tried to find a tree to tie up until the fog lifted, records show, a barge struck a bridge support, bending the rail tracks more than one yard out of line just eight minutes before the Amtrak train arrived. On board the Sunset Limited, Andrea Chancey was trying to doze off as the train click-clacked through the night. "My dad was sitting in front of my mom and I was sitting next to my mom, and for some reason I couldn't sleep," said Chancey. "I had my head on her belly and she was rubbing me." Traveling at 72 mph (116 kph), the lead locomotive reached the bridge and jumped the track at the spot where the rails were bent by the barge collision. The 3,000-horsepower, 240-ton engine flew across the bayou, embedding in about 46 feet of mud on the opposite bank. Two other locomotives followed it into the water, along with a baggage car, a crew dorm car and two passenger coaches. Chancey remembers tumbling as her double-decker coach, Car No. 34083, sailed off the end of the bridge and into the bayou. Her mother "pushed me and I fell and I saw my dad fall and when the water came in it was like, 'Wow," she said. "And everything went black." Chancey doesn't recall seeing either of her parents again, possibly because of water rushing into the car and inky darkness — the only light came from burning diesel fuel that spilled from the locomotives. But she does remember a few people who got her out of the wreckage, including Ivory, who had decided to take the train to North Carolina to see his wife only after missing a commercial flight. Ivory said he was on the upper level of the train getting people out of the bottom level when someone thrust the child above the water that was filling the coach. It was pitch black, the only light coming from burning diesel fuel just yards away. "Whoever it was was being consumed by the water at that time," he recalled. "I didn't ever get to see who handed her up, but I assumed it was her parents." After the crash, Andrea was hospitalized with injuries that included oil inhalation. It was left to relatives to tell her that her parents had died. The "miracle child," as the media called her, went to live with the family of her mother's older sister in Lancaster, Ohio, until she was 18. Her upkeep was funded partly by a trust fund set up by Amtrak and CSX, which owned the bridge. After briefly attending Wright State University and a failed marriage, Chancey wound up back on the Mississippi coast in Biloxi, where she lives today in an apartment with an assistance dog. Still in a wheelchair, she has help during daylight hours from home health aides. Chancey gets news alerts on her phone, and she's always shaken when another passenger train crashes. "Whenever I see Amtrak has another accident, I call my aunt and I say, 'They did it again. They did it again,'" she said. Ivory, who was honored by the Coast Guard with another passenger, Michael Dopheide, for his life-saving efforts that night, also struggled with the aftermath. He wondered both why he survived and why he couldn't save more people. For a while, the smell of diesel fuel took him back to the scene of the crash; he figures his work in oil fields where diesel is abundant helped him tamp down the response. Odom, the towboat pilot, was named as a defendant in more than 90 lawsuits after the crash but never faced criminal charges. He told investigators he felt a "bump" as he was pushing the barges that night but didn't realize what had happened until he heard a "whoosh" and saw the glow of fire through the fog. Still near the crash site, the Mauvilla and its crew helped pull people from the water. Odom did not respond to an interview request. He hasn't worked in the river industry since and has struggled for more than two decades with the guilt and pain of what happened, said brother Morsco Odom — though over time, his anguish has eased a bit. "The nightmares aren't as bad," he said. Andrea Chancey didn't attend a memorial service held in 2016 to honor victims of the crash, and she's never seen a monument erected at the site of the repaired bridge recalling the disaster. Despite worsening health problems linked in part to cerebral palsy, Chancey expresses less concern about herself than for Odom, who she doesn't blame for the loss of her parents. The bayou bridge should have been in better shape to begin with, she said, and Amtrak has had too many accidents in the years since. Willie Odom has suffered enough, Chancey said, particularly considering he helped save 17 people after the crash — including her — using the same towboat that hit the bridge. "I don't blame him one bit," Chancey said. Ivory, too, holds nothing against Odom. Too much time has passed, he said. But ever since the crash, Ivory said, he has always checked on airline flights well in advance. "I haven't taken another train since then," said Ivory.